Thanks for this, Jerry – it’s an attractive edition and as you say “A good fit!”. 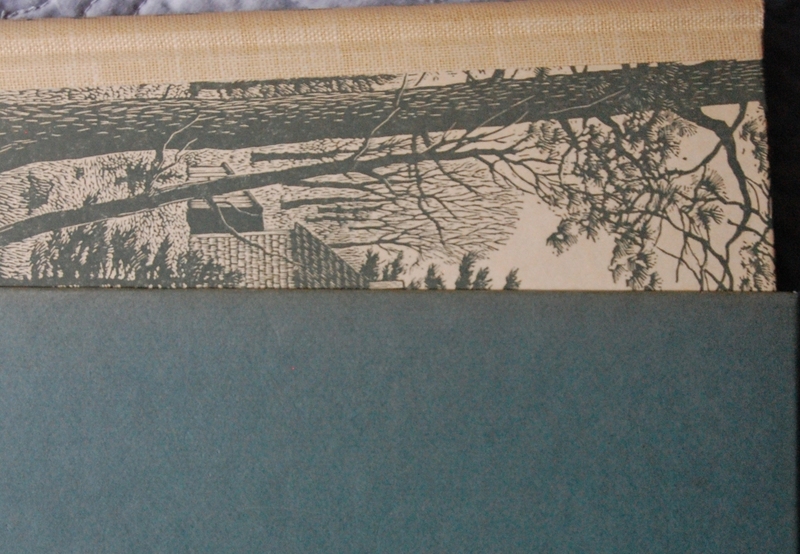 I much prefer it to the oversized ‘luxury’ Folio Society edition (2009) which I bought for reasons that now escape me. Like the LEC it was illustrated with photographs, in this case from the 1890s. I haven’t seen Edward Steichen’s photos for the LEC, but the Folio ones are so depressingly bleak I think I gave the book to a charity shop almost at once. Either that or I hid it somewhere! 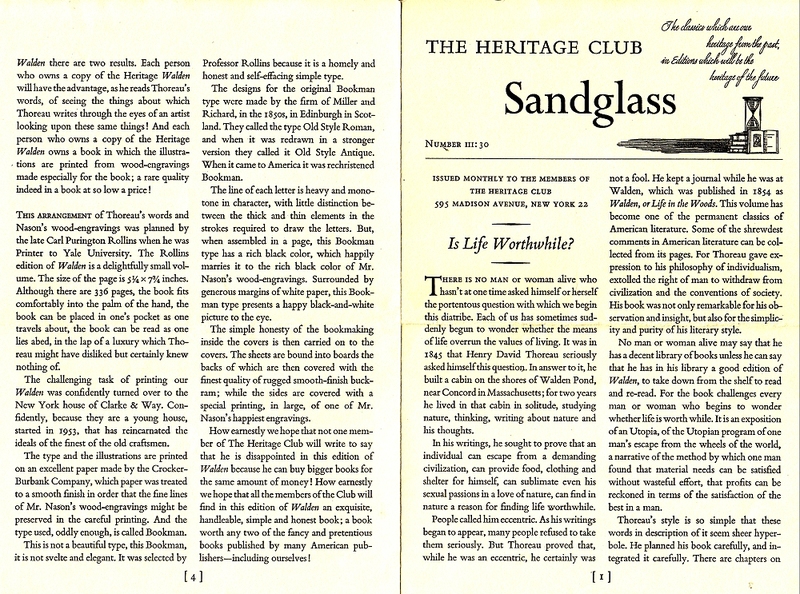 Folio published a less pretentious version back in the 1980s. 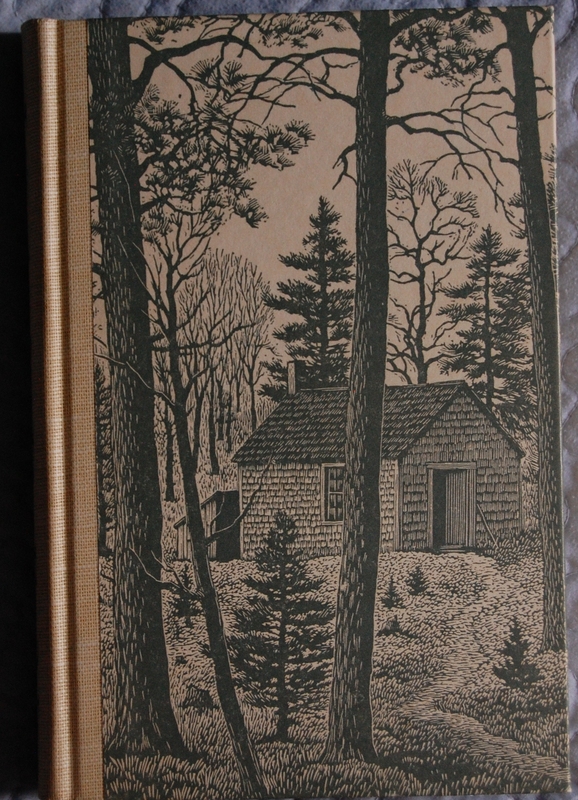 Like this HP edition it is illustrated by a first-class wood engraver, Michael Renton. I like his work and have been thinking of picking up a copy. But from the pictures you’ve posted, I reckon Carl Purington Rollins and Thomas Nason win hands down. So that’s another HP for the must-have list! Hi Jack. I have a C.P. 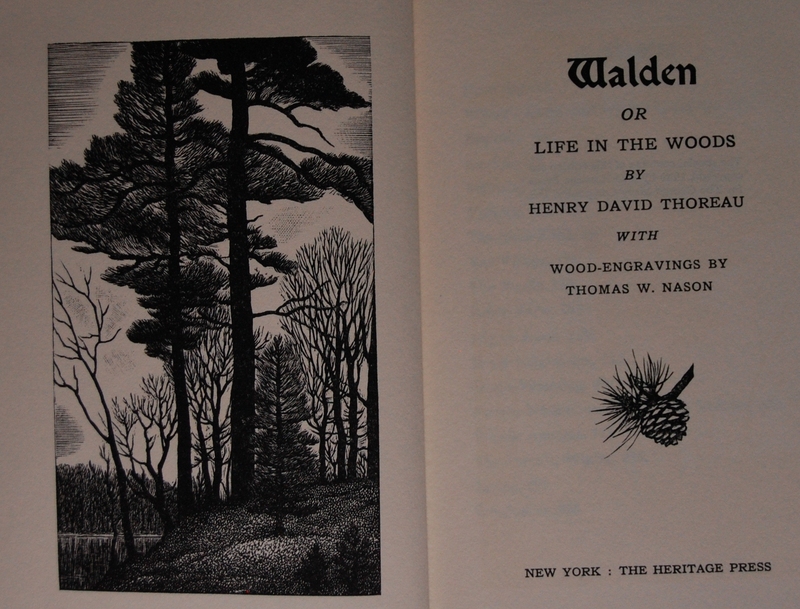 Rollins/ Thomas Nason copy of Walden from 1939, The Heritage press New York. I haven’t seen another. Were there many printed? Just so you know, Jack was the previous commenter, and he doesn’t work here or anything, so he can’t answer your question. 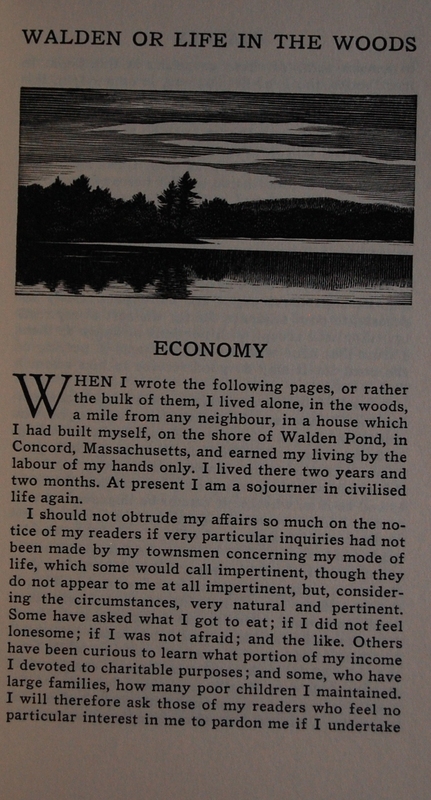 I don’t know the limitation of the original Walden printing, and with the number of reprints out there it’s very difficult to gauge Heritage print runs if they don’t explicitly tell you in the book itself. Sorry! I would imagine that misprinting and/or misbinding would be a rarity in the early days of the club, but the standards slipped when the Heritage Press transitioned to its new homes in Connecticut. 1968 was really close to the beginning of that period, which could explain that. I haven’t seen a book with that mishap myself, but I have stumbled upon a Huck Finn with Tom Sawyer boards before. That’s what I know; it may not be a bad idea to chat with my fellow collectors at the George Macy Devotees at Librarything! And I’ve enjoyed your website – good info. Just found this volume at an antique fair for a few bucks. I own the original issuing, but I figured it wouldn’t hurt to have this one too. Might make a nice gift. 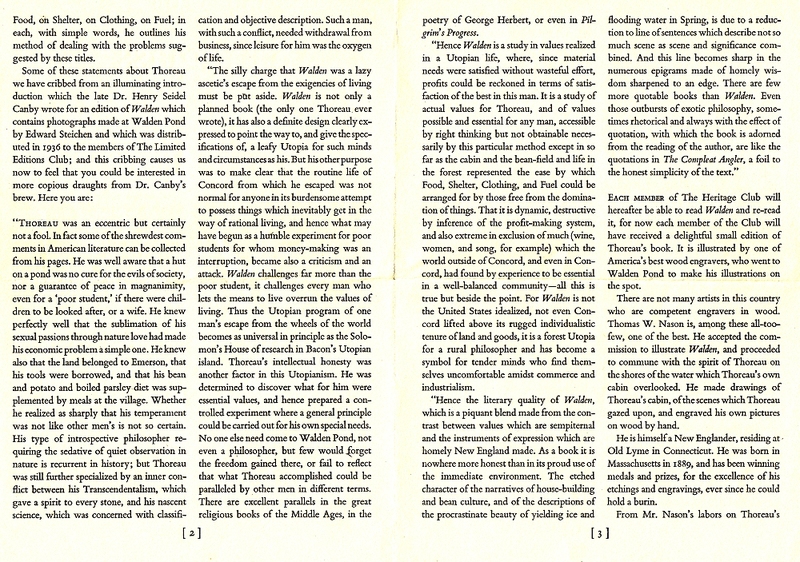 Interesting though, Heritage took out the original colophon which contains what I think is the most valuable and interesting fact about this edition: Thomas Nason made the wood engravings at Walden Pond. Now why would anyone leave that out? Ah, the Sandglass does make that clear. My mistake. No worries; I should probably mention that in the post. Next time I do some editing, I’ll throw that in. Thanks! 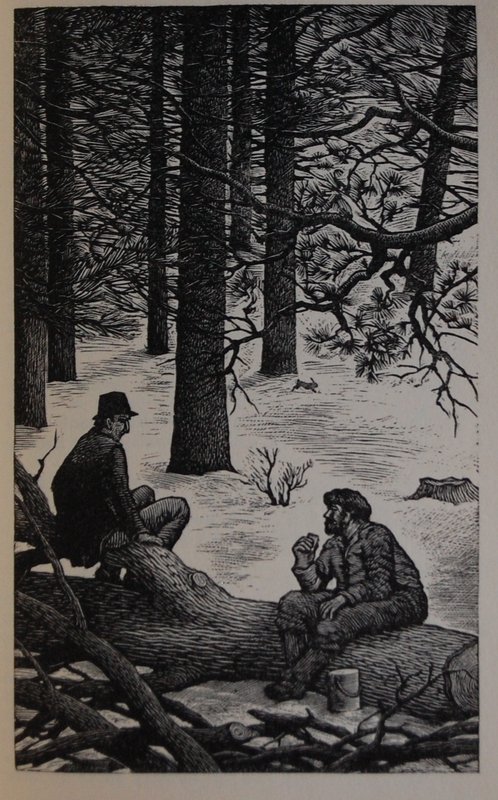 You are currently reading Heritage Press – Walden by Henry David Thoreau (1939*) at The George Macy Imagery.